These are sub-species of the Sand Lizard found throughout much of the former USSR and beyond. 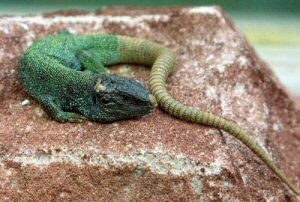 They are frequently imported and sold as "Black Headed Green Lizards" or "Black Headed Sand Lizards". Their Russian name translates to "Common Lizard" which gives an idea of their status in the wild as against that of the UK and western European sub-species of Sand Lizard. In this context I MUST remind you that the species is strictly protected in the UK and even the possession of a wild-caught UK specimen without a UK licence is against the law and carries a substantial penalty. These imported Russian animals are, however, perfectly legal. 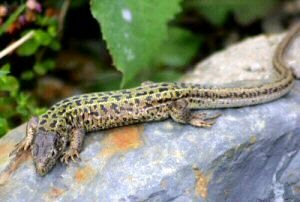 They are identical in build to our Sand Lizard but are somewhat larger. Females and young animals look similar but carry an unbroken pale line down the centre of the back. Females can be both grey/brown with heavy markings or, occasionally green and usually still well marked. Most adult males lose their markings and appear a uniform green in the breeding season although this fades outside the season. Close inspection will reveal typical markings are present although very weakly pronounced. Adult males also usually exhibit a slate grey or blue head often so dark as to appear almost black - thus the name they are usually sold under. This species has been kept successfully by many people in indoor vivaria (although a hibernation period is essential) and does particularly well in outdoor vivaria so long as these are not too damp. Indoors, a pair could be kept in a vivarium of about 1m x 0.5m. Possibly a second female could be kept in this area although the females might have to be separated when gravid. Certainly, more than one adult male should not be kept in this area as these animals are extremely territorial and aggressive to one another. They will thrive in a semi-desert set up. Hiding places must be provided and ideally the vivarium should contain a substantial heap of sand for burrowing as well. A clean water bowl should be provided but the vivarium should also be lightly sprayed each morning to represent dew as some individuals will only drink this way. They must have good UV lighting and a substantial temperature gradient. The ambient temperature during the summer should be around 25-30ºC during daytime in the summer with a basking hotspot of around 40ºC. At night the temperature should drop to around 15ºC. During the winter, the overall temperature should be held between 5 and 10º. In the wild these animals experience an extreme continental climate with hot summers but long bitter winters. Due to these extreme conditions some individuals will insist on following their wild hibernation patterns i.e. from September to March. This does present problems as the lower hibernation temperatures referred to above will have to be sustained for this period. They also do well in outdoor vivaria. Again, a cold-frame will support a pair or one male and two females and this can be increased with vivarium size. Once the principle dimension exceeds 2 metres it is usually safe to keep 2 males in the same enclosure. Their only problem with our climate is that they are not used to such extreme dampness. To help them cope with this a very well drained sub-strate is essential. For hibernation this can be further enhanced by having a sand slope with a well supported large flat rock embedded in it. They can then burrow under this and be well protected from dampness. Although some individuals will use provided hibernacula, most will prefer to dig into the soil. The slope itself should face southwards and will provide an ideal area for laying eggs. Open basking areas are essential. In terms of vegetation, heaths and heathers are excellent although grasses and ornamental ground cover plants are also appreciated. Mating takes place during the Spring and is typical of lacertids (see our Breeding pages). After a period of 1 to 2 months the female will be extremely fat - individual egg bulges are often visible. She will usually dig one or two test burrows in a warm spot before choosing where to lay the eggs. She will lay anywhere from 4 to 14 eggs and, ideally, these should be dug up and incubated artificially. When the young hatch, they will usually start feeding within 24 hours of birth. In optimum conditions, the adults will mate again and produce a second clutch about 6 weeks after the first. It is wise to keep them separated from the adults for the first few weeks of their lives or they will almost certainly be cannibalised. Growth is extremely rapid and they can go back with the adults within a few weeks - well before they need to hibernate. These are primarily insectivorous lizards and should be fed a suitable range of insects. When fully grown they can handle any of the invertebrates listed in our live foods page with only the exception of adult locusts - and the odd very large male will even manage these. These should be gut loaded and dusted with a suitable multivitamin powder. If you are fortunate enough to have them breed then at this stage they require small insects - second or third stage crickets are good as are buffalo worms or other similar sized prey. Gut-loading and vitamin dusting are essential. As initially stated these animals are occasionally imported and can be found in pet shops. A search of the internet will sometimes find them. A small number of breeders produce a surplus and will also happily sell some of their offspring. Understandably, most of these breeders do expect you to have the appropriate facilities and knowledge as the objective is to spread breeding colonies among a number of keepers. Other sub-species are occasionally available as captive bred animals, in particular L.a. argus (which includes the red-backed form) and L.a. chersonensis. Remember that the former is a European Protected Species so ensure that any animals you buy are captive-bred and that the breeder provides you with a Certificate of Origin certifying this. REMEMBER: Do NOT go out and catch native Sand Lizards. This is illegal (justifiably so) and there are differences in their maintenance.